This volume provides a mathematical foundation for time seriesanalysis and prediction theory using the idea of regression and thegeometry of Hilbert spaces. It presents an overview of the tools oftime series data analysis, a detailed structural analysis ofstationary processes through various reparameterizations employingtechniques from prediction theory, digital signal processing, andlinear algebra. The author emphasizes the foundation and structureof time series and backs up this coverage with theory andapplication. 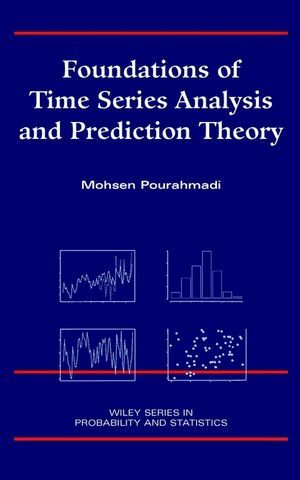 Foundations of Time Series Analysis and Prediction Theory guidesreaders from the very applied principles of time series analysisthrough the most theoretical underpinnings of prediction theory. Itprovides a firm foundation for a widely applicable subject forstudents, researchers, and professionals in diverse scientificfields. MOHSEN POURAHMADI, PhD, is Professor and Director of the Division of Statistics at Northern Illinois University in DeKalb, Illinois. Time Series Analysis: One Long Series. Time Series Analysis: Many Short Series. Finite Prediction and Partial Correlations. Missing Values: Past and Future. Stationary Sequences in Hilbert Spaces. Appendix B: The Bayesian Forecasting.